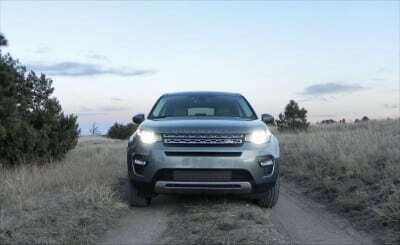 Brand new for 2015, the Land Rover Discovery Sport is the more everyday version of the popular Land Rover Discovery. 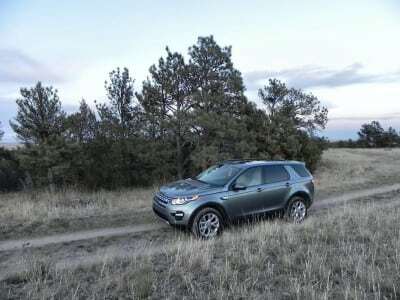 With less emphasis on offroad trail driving and more on road comfort, the 2015 Land Rover Discovery Sport is a great daily driver that still has the capability Rover buyers expect. One of the few true sport utilities still on the market, the 2015 Land Rover Discovery Sport is a sort of holdout. Rover, of course, doesn’t tend to build anything else, though some might argue that the Range Rover Evoque is more crossover than SUV. 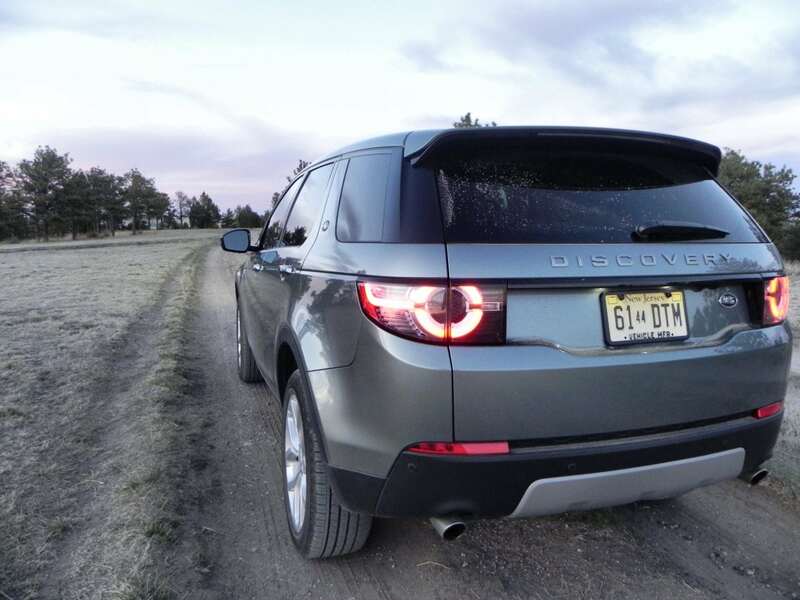 Regardless, the 2015 Discovery Sport blurs the line a bit between crossover and SUV by adding a lot more road comfort than Land Rover fans might expect it to have. The Discovery Sport and Evoque have a few things in common, namely their shared platform and common engine. 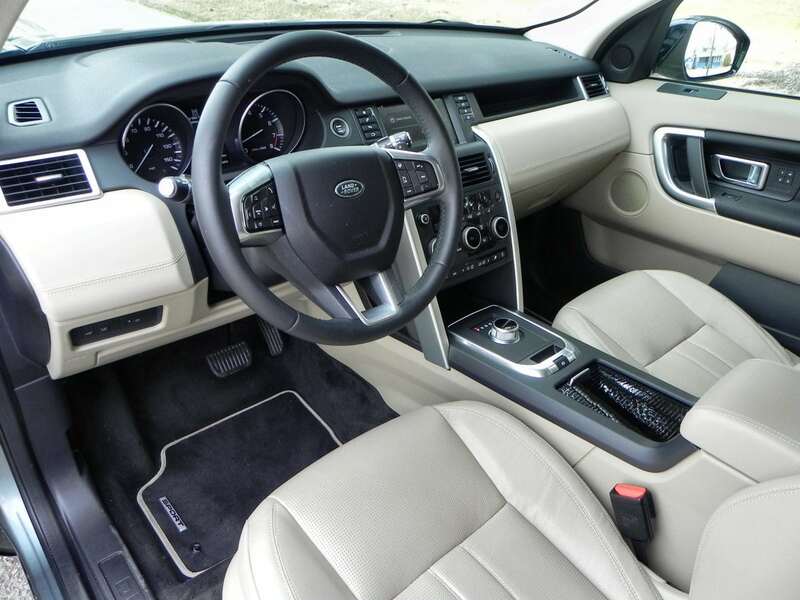 The difference is that the Evoque is more about looking good and being luxurious than it is about getting you there. The Discovery Sport keeps the Land Rover looks going, but retains the offroad capability one expects from something with the Rover name on it. 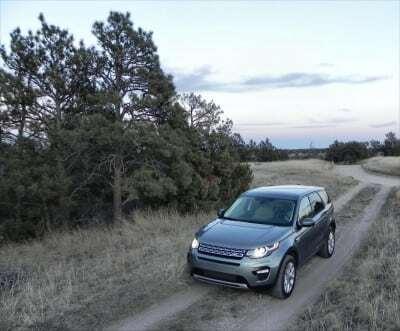 The 2015 Discovery Sport is offered with one engine option, three trim levels, and several package options. 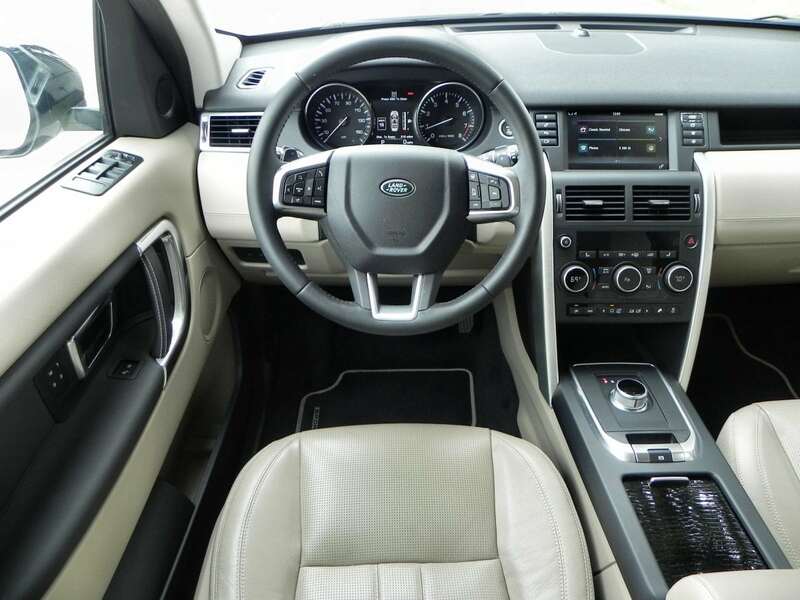 The base model SE comes well-equipped while the mid-range HSE offers a bit more comfort. 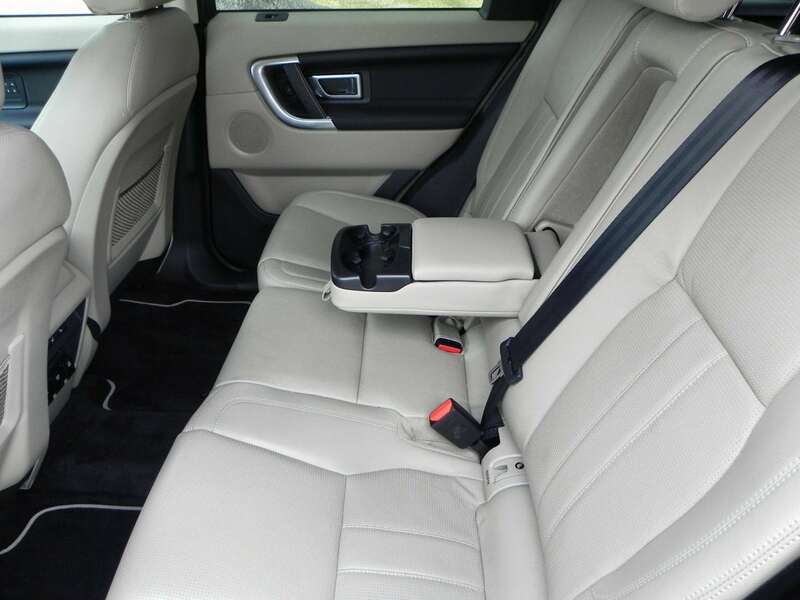 The HSE Luxury, as we drove it, offers a relatively posh interior with plenty of amenities. 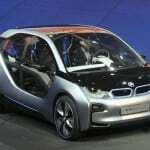 Of note is the dropping of the “Sport” naming convention, which in Europe usually denotes the two-row version of a three-row vehicle. In this case, a third row is an option with the Discovery Sport. Going with a more American style, the 2015 Discovery Sport is less about “sport” than it is about naming for the name’s sake. 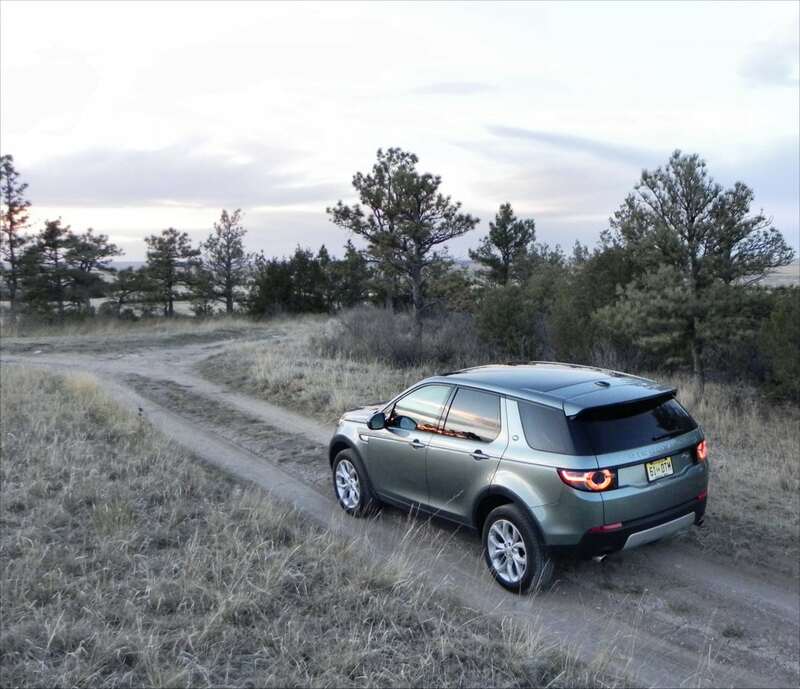 Those familiar with the Discovery from Land Rover will recognize its lineage in the Discovery Sport. The general design and shape are almost identical, though the Sport is obviously smaller in size. The hood line and grille are well-matched and flow upwards with the signature Rover “hood sill” draping down to create a one-piece appearance for the engine cover. 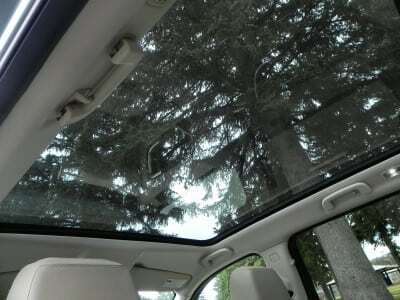 The windscreen rakes back quickly to a long, slightly sloping roof line that ends with a small spoiler over the outward-curving hatch. Along the sides are a Land Rover sliver cut into the light fenders that sit over big tires and wheels. 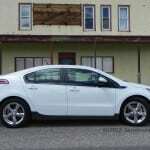 From that cut runs a character line that passes through the door handles and ends at the top of the rear tail lamps. A light bone line runs underneath that to accentuate it and a running board indent at the base of the doors creates curvature for them. It’s a contemporary, sleek look that has been copied more times than we can count. Our test model also features beautiful five-petal wheels. 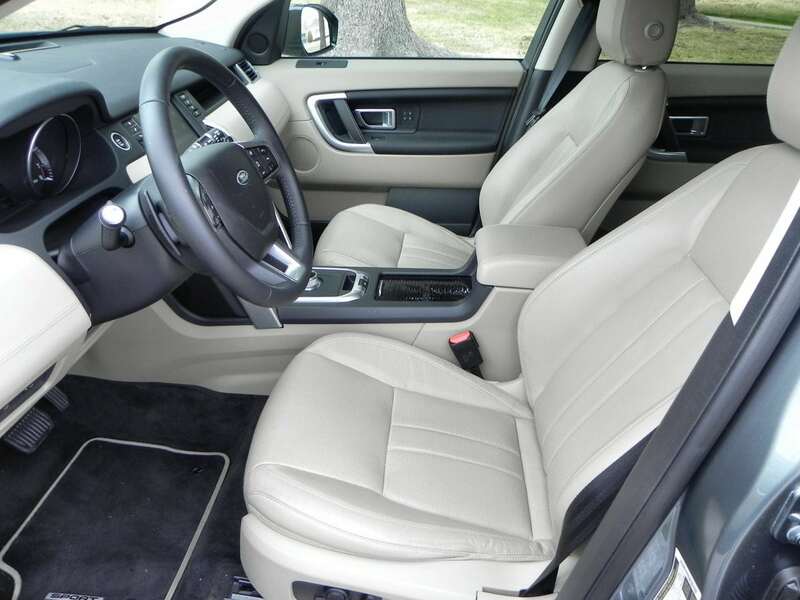 The Land Rover Discovery Sport’s interior is conservatively designed, but offers quality materials and an old world style. 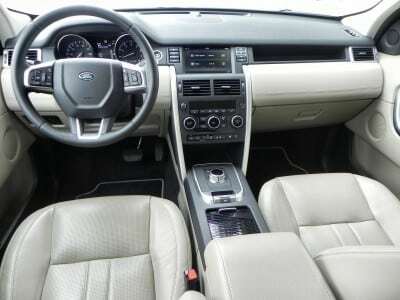 Nothing in the interior “pops” at the passengers, but all of it feels well-made and fitted. 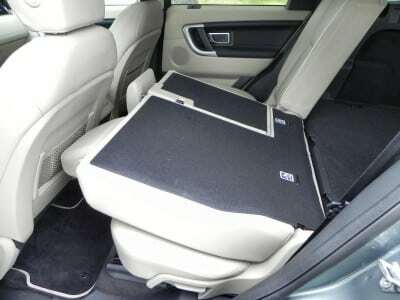 The front seating is excellent and easily adjustable. The second row has good leg and headroom and seats two comfortably. Three may be a squeeze for some, but is doable. We did not have the optional third row in our tester, but it would obviously only be suitable for children. The cargo area of the 2015 Discovery Sport is nicely sized and easily accessed. 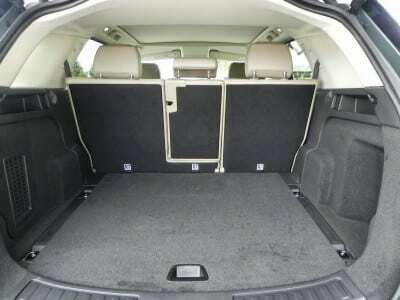 The wide, square opening and up to 60 cubic feet (with second row folded) is great. While the size, on paper, is similar to others in this class, it’s far more usable thanks to the more square build of the hatchback entry and truly flat space created when the second row is folded. 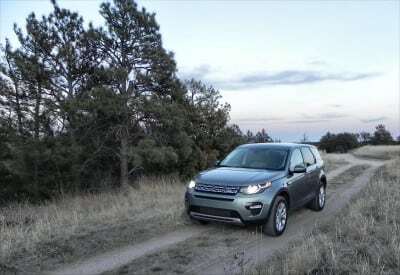 The 2015 Discovery Sport is offered with only one engine option, a turbocharged four-cylinder displacing two liters and outputting 240 horsepower and 250 pound-feet of torque. This runs through a nine-speed automatic transmission which utilizes steering wheel-mounted paddle shifters. All-wheel drive is also standard. The EPA rates the Discovery Sport at 22 mpg combined, 20 mpg in the city and 26 mpg on the highway. Our real-world use of the SUV found that to be close to reality, where we averaged about 24 mpg with a mix of highway, freeway, and offroad use. 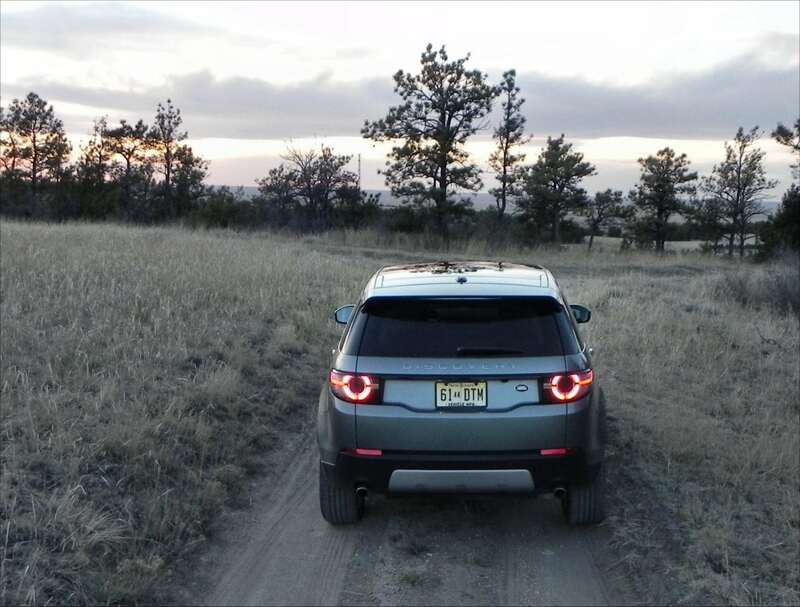 Land Rover gives the Discovery Sport a tow rating of 4,400 pounds and change. 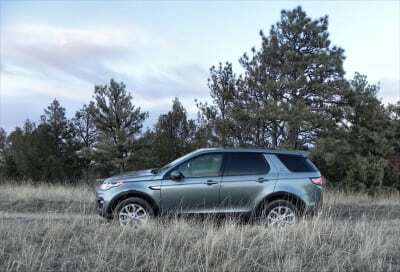 The real excellence in the Discovery Sport’s powertrain, however, is in the Land Rover Terrain Response System. This gives the driver selectable settings for the terrain being encountered which in turn tunes the vehicle’s output and torque vectoring to match the need. 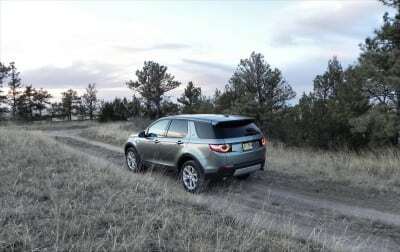 The Discovery Sport offers four settings: General, Grass/Gravel/Snow, Mud/Ruts, and Sand. Each of these adapts throttle response, steering response, gear selection ratios, and more. It’s a beautiful system that works very, very well. It’s been tried and proven in several Land Rover and Range Rover vehicles. 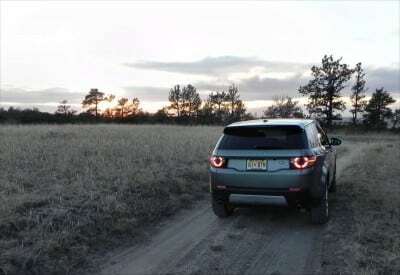 The road drive in the 2015 Discovery Sport was surprisingly smooth. It was fully expected that this capable sport utility, like most with its legendary abilities, would be a harsh ride on the pavement. 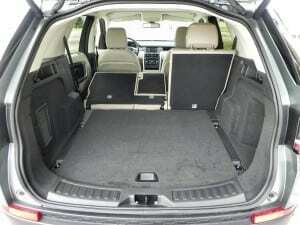 Yet it turned out to be very well-mannered and nicely cushioned for the freeway. Compared to others in the competition list below, it’s easily on par with what would be expected from its peers. 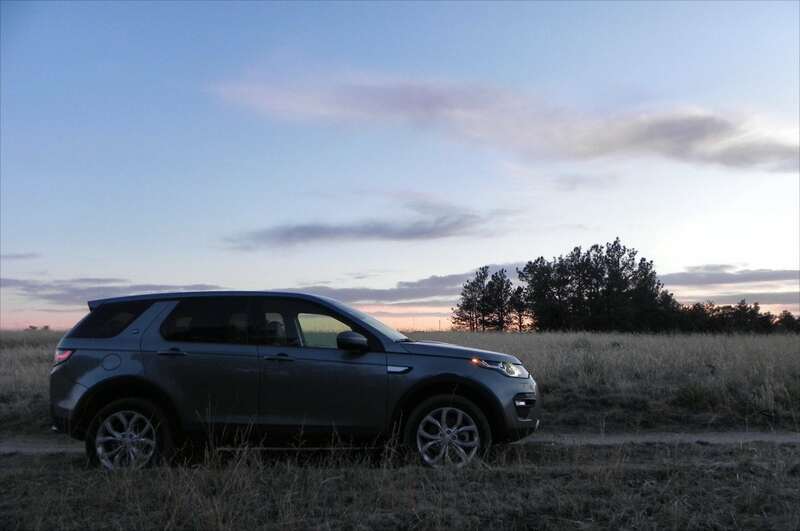 Around town, the Discovery Sport’s SUV nature comes to the fore. Its steering radius isn’t as sharp as some crossovers may be and its turbocharged engine is a bit slow on the uptake when driving in traffic and stop-and-go scenarios. 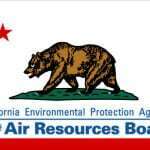 Fuel economy drops very low as well. In parking and maneuvering, though, the Discovery Sport is nimble enough for most needs and visibility for the driver is very good. The rearview camera via the 8-inch touchscreen is a boon. When properly used, the Terrain Response system gives the Land Rover Discovery Sport a lot of capability. In our week with the Rover, we drove it in various offroad scenarios that included bouncing along a dirt track, hitting soft dirt with gusto, powering up inclines with unsure footing, and more. In heavy off-track use, the Discovery Sport proved itself to be more than capable. If the clearance for the vehicle can be had, it can do whatever is needed. 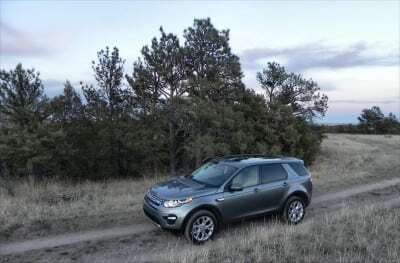 So despite the great highway drive that the 2015 Discovery Sport offers, it still has plenty of capability when off the pavement and out in the wild. There is a lot of competition in the premium crossover and sometimes-SUV segment. The Discovery Sport competes with great entries like the Volvo XC60, BMW X3, Acura RDX, Lexus GX 460, and Audi Q5. Of those, though, only the Discovery is a true SUV and of the group, it’s the most trail capable. The others, though, will offer more interior luxury and (often) better fuel economy and perhaps more style as well. Very offroad capable despite its highway comfort. Not as fuel efficient as some competition. 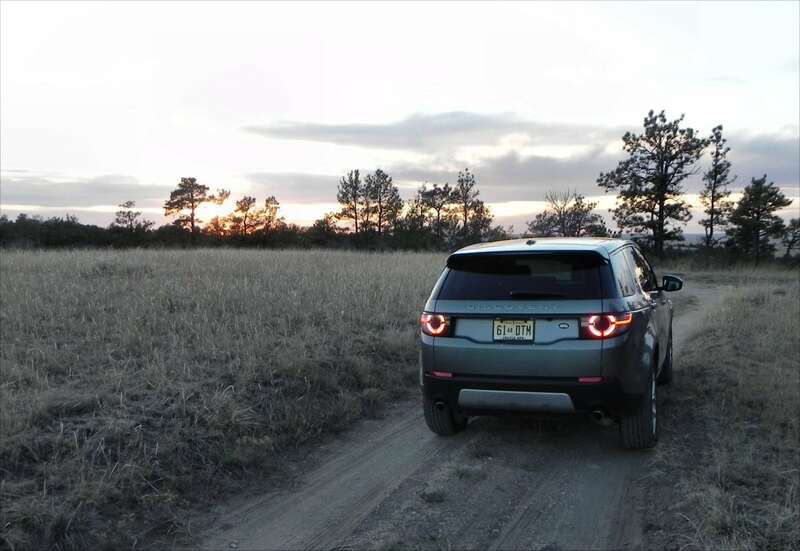 Not for everyone, the 2015 Land Rover Discovery Sport is a well-made small SUV with a crossover’s road appeal. 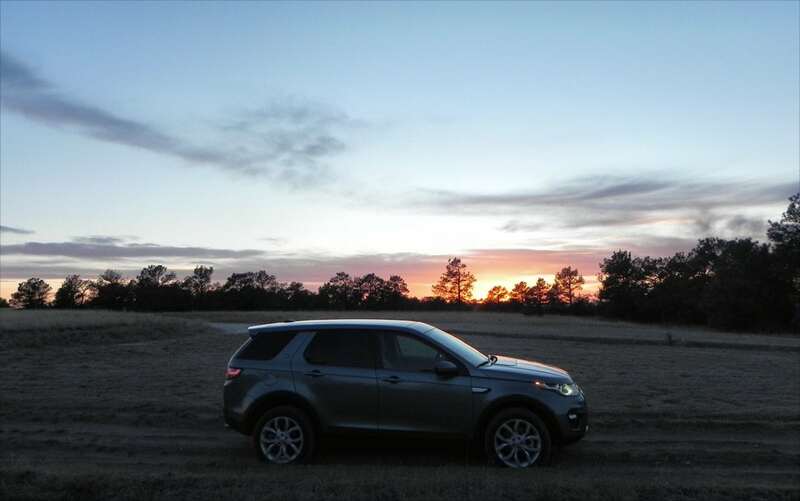 With plenty of capability off the road, it sacrifices fuel economy to achieve that. For those who need a daily driver that is more than capable to get them wherever they need to be, whether it be the office or the wilderness, the 2015 Discovery Sport is an excellent option. The Discovery Sport was a manufacturer’s press loan for about a week. 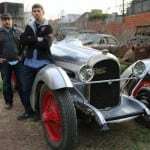 During that time, a total of 304 miles were put on the vehicle in a mix of in-town, highway, and freeway driving as well as offroad. Passenger loads varied from a solo driver to five people in all.